German cockroaches are known indoor cockroaches with a distribution that is worldwide. Adults are easily recognizable by their light brown or tan coloration with two black horizontal stripes located in the pronotum immediately behind the head and growing up to a length of 13-16 mm. The much smaller youngsters, or nymphs, are darker, almost black, also with black streaks behind their heads. While German adult cockroaches have wings, they rarely fly, preferring to run. Young cockroaches are wingless and almost black with a single light streak running through the center of the back, and adults are about 5/8 inches long. Egg capsules are a light tan and produce about 36 baby cockroaches. Although they can live outdoors in tropical environments, German cockroaches are more commonly found in the interior, with a preference for the warmer and more humid areas of a structure. In homes, these insects are usually found in kitchens and bathrooms but can be moved to other parts of a house if food and moisture are available. In most cases, German cockroaches are introduced into a structure or residence when bags, boxes or cartons are introduced into the home. They can even be brought with used appliances. In multi-unit apartment buildings, German cockroaches can be quickly moved between units, using shared piping and pipes as a road. German cockroaches usually develop in kitchens and bathrooms. 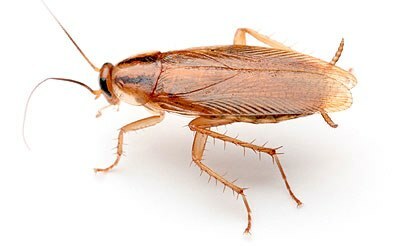 During the day, these cockroaches can be found hidden behind base moldings, pictures and clocks, in cracks around cabinets, cupboards or pantries, and inside and under stoves, refrigerators, and dishwashers. German cockroaches do not like movement and usually avoid light.